People who enjoy the academic rigor of a peer-reviewed book, but actually want to enjoy reading said book. Also, people who find the idea of cheating (in all its forms) fascinating. Law professor and legal ethicist Rhode examines why people cheat, and what society can do to mitigate those tendencies. I love ethics — studying it, reading about it, thinking about it. Unlike everyone in The Good Place, I love moral philosophy professors. 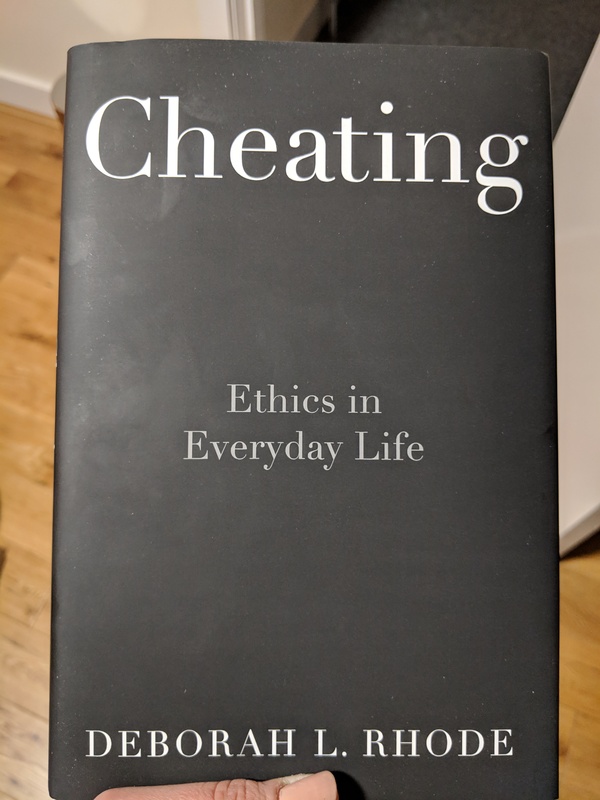 And while I’ve read articles and books on many different topics in ethics, I hadn’t seen one focused solely on cheating. Have you ever stacked your ships in the same line in Battleship? Have you ‘forgotten’ to report to the IRS the cash earnings from nannying during graduate school? Have borrowed your sorority sister’s paper for the class you’re in, which she got a 4.0 in a year prior? In this book, Rhode examines multiple types of cheating, spending a chapter on each. She looks at not just what many of you probably thought of when you saw the title — adultery — but also cheating in sports, at work, on taxes, at school, and committing copyright infringement and cheating related to insurance claims and mortgage applications. 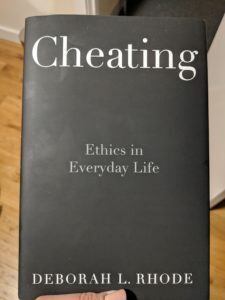 Each chapter offers examples of the types of cheating in that particular area, then looks at what might cause it, and then crucially, what might be an effective way of preventing it. In some cases, that is increasing the punishment (such as corporate malfeasance), while in other areas it means getting creative (such as with making music widely available for low subscription fees). As you read this, you might balk at some things that she considers cheating, while other things will be very clear. I know so many people who illegally download music and films and see no problem with it, and would be shocked that it is included in such a book. Others might find her stance on how to punish marital infidelity — personally, not legally or financially — to lenient. I think you can make arguments on all sides. But it’s interesting to read and to really think through, especially given who the US President and GOP leadership are right now (and this book came out last year, so the US President is mentioned a few times). While the book is over 200 pages, it is so thoroughly backed up with research that the notes take up 60 of those pages. It is a pretty quick and easy read, given the subject matter. Donate it, because while I enjoyed it, I can’t see myself reading it again.